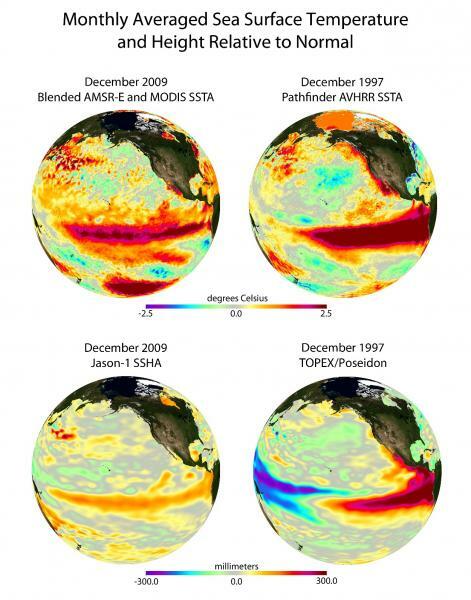 The images compare sea surface temperature (SST) and sea surface height (SSH) anomalies associated with the mature phase of the 1997-98 and 2009-10 El Nino events (in December 1997 and 2009, respectively). SST and SSH anomalies reflect the heat content in the mixed layer (approximately upper 50 m) and the upper ocean (approximately upper 150 m) respectively. They provide complimentary views of the oceanic signature of climate variability El Nino. The comparison indicate that the warming associated with the moderate 2009-10 El Nino actually extends further west than the 1997-98 El Nino. Although the latter is considered the “event of the century” because of the large amplitude of the SST anomaly in the eastern equatorial Pacific, the warming in the central equatorial Pacific is not as pronounced as that for the 2009-10 El Nino.